The life of Newlyn trawlerman Mike Mahon - part II. Veteran Fishing News reporter Phil Lockley continues Grimmy’s story as the political fight begins. Grimmy: Tell it as it is. When the senseless dumping of fish gained media attention, waiting in the wings was Grimmy, and the intensity of his activities increased. To us in the media, Grimmy was so easy to get a quote from. He still gravitates toward radio, television, or anyone with a notebook in their hand. He has no fear of being quoted, and even if we blew the tale out of all proportion, Grimmy would shrug his shoulders and say, ‘no news is the only bad news’. In the referendum, Cornwall scored a Brexit majority, and perhaps Grimmy’s many years of battering the EU by taunting the Marine Management Organisation (MMO) helped to achieve that. After selling his boat and licence to a flagship company, Grimmy stayed in fishing, shortly afterwards purchasing the 41ft steel trawler Betty G. Meanwhile, his political fight intensified. 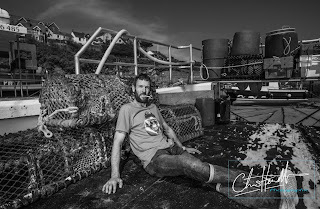 I talked to Grimmy about his views on the future of the UK fishing industry, and how even after Brexit, the fight of British fishermen to rid themselves of EU rule may fail. Grimmy and Brian Tobin were united in promoting the fishing industries in Canada and its mother country, the UK. 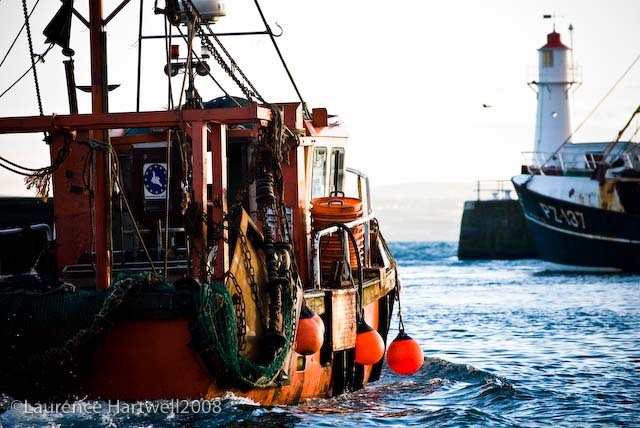 If you are a Brexiteer, read on; it will raise your hopes – and if you are a Remainer, please read on to understand why a huge percentage of British fishermen voted for Brexit, and how Brexit warriors like ex-skipper Mike Mahon will fight on until Britain truly becomes an independent coastal state. Grimmy said: “I never did agree with licences or quotas. In Canada, they have a system where, each year, you pay for your licences; you might do several types of fishing, so you have to buy the appropriate licences. One licence might cost you $10 and another might cost you thousands of dollars; it depends on the profitability of the fishery – and when you leave that type of fishing, those licences cannot be traded, but are returned to the Canadian government. “That sounds a bad deal for Canadian fishermen, but I believe that part of the licence fee is kept back until you retire, and then that money is returned to you, like a pension. “If there is too much fishing, the Canadian government keeps back the relevant licences, and when the stocks are looking better, those licences go back into circulation. That system works, and works very well. But from day one, the system over here has been an absolute disaster. 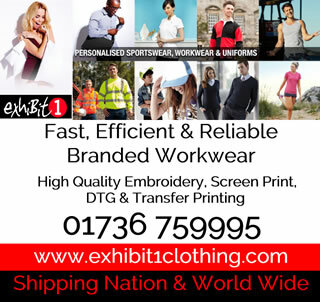 “Looking back to when I transferred the licence from Joal to a flagship company – and when the MAFF (now MMO) district inspector at Plymouth, Colin George, said I shouldn’t – I can remember the front page of Fishing News reporting on how John Gummer, fisheries minister at that time, had banned the transfer of licences from boats under 80ft in length to boats over 80ft. “I was OK – the transfer of Joal to Joe O’Connor had taken place, and he had paid me in full – but there were others who were hit by that new rule, and couldn’t go ahead. Some had already received their 10% deposit, and I believe that they were allowed to keep it, but they were given their boats back. “Betty G was a good little boat, and I worked her single-handed quite easily, but as for other fishermen, with quotas and restrictions and the way things were going, it was depressing – it took the fun out of fishing. I was dumping cod day after day. And of all the cod fishing that I have done – in Iceland, Greenland, the White Sea, the North Sea – the best cod fishing I ever saw was in 1988, fishing off Newlyn. Truly, the ground was knee-deep with cod. 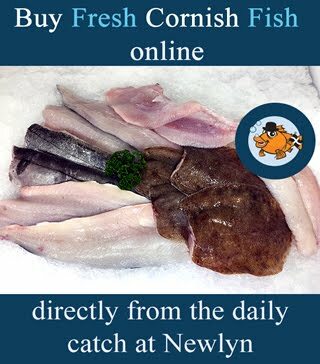 “But we caught most of the year’s quota in three days, and together, the Newlyn boats alone were dumping thousands and thousands of tonnes of cod. “Eventually, we had a ban for three months to prevent dumping, but then a small quota was given, dumping continued, and the ban came back. It was a nightmare. On one day, I was dumping two to three tonnes of cod per tow. When you take into account the size and horsepower of Betty G – just 127hp from a Gardner 6LXB, and it was a bus engine, not a proper marine engine – now, compare that to a big sidewinder. And I used no fancy style of trawl, either, just an 8.5 fathom net from the old Concord pattern, the same pattern as we used on the Grimsby boats. “Comparing those catches off Cornish boats to the catches of cod we had on the Grimsby sidewinders, the catches of Cornwall were massive. We all suffered the consequences of EU quotas, and we were forced to throw back a huge tonnage of dead fish. “I remember Fishing News covering the story one week, when I made £5,000 but had to dump over £6,000-worth of cod to do that. Had the Newlyn fleet – for example – been allowed to keep those fish, there wouldn’t have been so much fish caught. 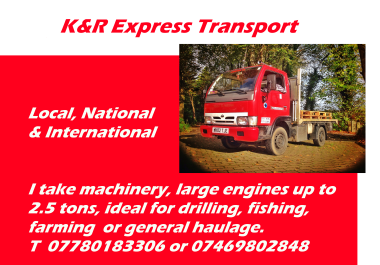 Fishing was so heavy that I, and other skippers like me, would have gone back to port more often – very often, in fact – so overall, there would have been a lot less fishing. It meant we were hammering more fish to make a standard wage. 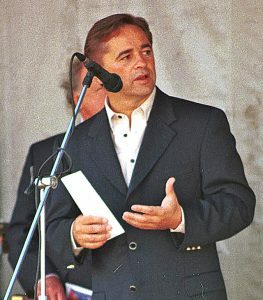 Brian Tobin, then Canadian minister of fisheries and oceans, and later premier of Newfoundland, was the guest of honour at the Newlyn Fish Festival. Jo-al heading for the gaps and another day at sea. “I couldn’t stand it any more, so to get away from the rules and regulations, I decommissioned Betty G and bought the under-10m trawler J-Anne BRD 92. But, as time went on, those regulations began to creep down to the smaller boats. The CFP is the biggest environmental disaster on record. I can remember the news reports of an Eyemouth skipper hauling up 2,000 boxes of coley. Fishing News said his net was bulging with fish right up to the mouth, but he had to dump the lot: £40,000-worth of fish were thrown away dead. That week he made £40,000, but he dumped £400,000-worth of coley to get it. And it wasn’t just him; every other boat was forced to do the same. You couldn’t move in the North Sea without catching coley, but those men had hardly any quota for coley. There’s only one word for dumping fish: criminal. “I had a television set on the Betty G. I never used to listen to the shipping forecast on Radio 4, but watched the lunchtime news; that was always a good forecast. I remember one day dumping several tonnes of cod, then looking at the BBC and seeing all those kids in Somalia starving to death. There is something wrong on this planet when you see people starving, with people just five hours’ flight-time away dumping astronomical amounts of fish. “By the time I had the J-Anne, the POs were getting stronger. I never liked the POs, and at that time, they were siding with the EU commission. Without the CFP, the POs were not necessary. I have never supported the POs; and in speaking on behalf of many fishermen south of Scotland, neither did I support the NFFO. “About 1995, while I was decommissioning the Betty G, I was at home watching a repeat of The World at War series, with the Canadian soldiers fighting alongside British troops, both streaming onto the Normandy beaches on D-Day. “After that programme, I watched the news, and there was a piece about how Spanish fishermen had plundered Canadian waters to take Greenland halibut, and how, one day, the Canadian government had had enough and arrested a Spanish boat, Estai. In the days after that conflict, it became known as the ‘Turbot War’. “However, our government clearly had a short memory, and backed Spain. That was enough for me. Through two world wars, Canadian soldiers fought alongside our soldiers, and in the Turbot War, our government backed Spain – a ridiculous and cowardly act. I was ashamed of our government. “My stepdaughter lived in Canada, and when we received presents, they were always wrapped in old Canadian newspapers, and as soon as I realised the severity of the Turbot War, I asked her if I could have some complete copies of the relevant newspapers. It was only then that I read the true reports about the Turbot War. So I asked for a Canadian flag to be sent over, so I could fly it from the J-Anne. She also sent a T-shirt with the Canadian flag on it, and I wore that with pride for a very long time. Almost right away, many others wanted a Canadian flag, so I phoned the Canadian High Commission in London to get some. “That weekend I was going to Yeovil to speak, as nothing but an angry ‘Joe Bloggs’ fisherman at a Tory rally. On the same platform were Bill Cash MP, Norman Tebbit MP, Christopher Booker, a writer for The Sunday Telegraph, and Ian Lentern, another Tory supporter. In my speech, I talked about our views on the Turbot War, and about my call to the Canadian High Commission to get more flags for our fishing boats to fly. “The audience was in uproar; they were cheering, and people were standing and yelling their Canadian support – there were over 1,200 people at the speech. “On BBC Newsnight that night, they showed Norman Tebbit speaking, but they had dubbed onto his speech the cheering and yelling that they recorded when I had spoken of Canada. Norman Tebbit’s speech had nothing to do with fishing. Conservative MP David Harris was a strong supporter of Mike Mahon’s Canadian flag protest. “So I couldn’t get the media to show interest in the fight between Canada and Spain. I came back home and phoned the Canadian High Commission; they hadn’t been told of my previous request for flags, and I had 1,200 people wanting to back our support, and they were delighted to hear of the support. So I grabbed several of the different Canadian newspapers that my stepdaughter had sent, and phoned the editors of two; they weren’t interested. “However, as a last shot, I phoned the Toronto Sun to ask a reporter, Robert Benzie, to put an appeal in his paper to obtain Canadian flags for us. Ten minutes later, the editor phoned back, asking if Robert Benzie and a Toronto Sun photographer could bring the flags over, and I immediately said yes. Until their scoop was on the front page of the Toronto Sun, they didn’t want any media coverage in the UK or in Canada. 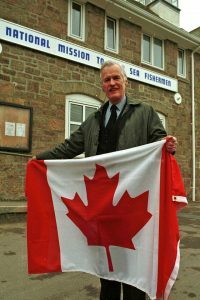 “Thirty-six hours later, Robert Benzie and his photographer were standing on Newlyn quay, holding seven Canadian flags. Before his flight, Robert Benzie had been into the nearest suitable shop and had bought its stock of flags. He was in such a rush to get the scoop that we only had seven flags; we still needed a lot more, but that seven was enough for the whole idea to rush ahead. The lads returned to Canada, and an eight-page exclusive in the Toronto Sun was published the day after; a further eight pages were printed the next day, and so on. But the national media here in the UK was still not interested. 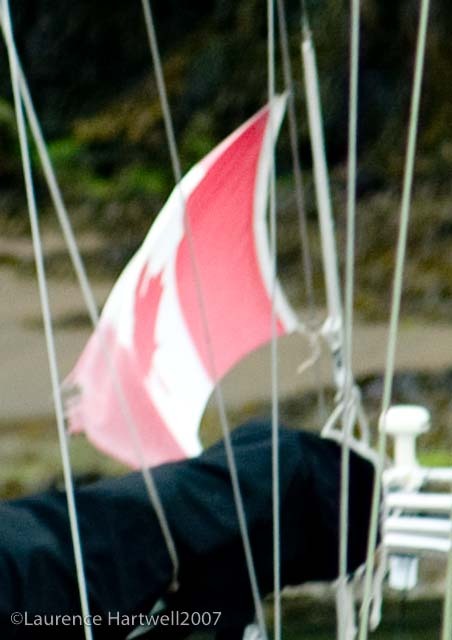 “So all we had were seven Canadian flags, flying on different boats in Newlyn. Local press photographer Phil Monkton took loads of pictures and the local papers covered it, but the British daily newspapers were still not interested. “However, four days later, what they call a ‘stringer’ in the press trade discovered the potential of the story, and the British daily newspapers went mad. Phil Monkton must have had the biggest payday ever. And every UK paper wanted its own scoop; my phone was ringing all day, every day; there were reporters and cameras everywhere. 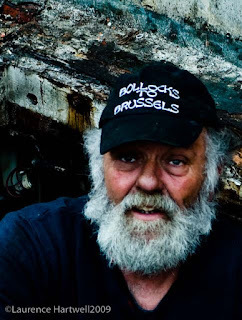 “Canadian fisheries were at war with the Spanish government – and we were at war with Brussels; what could have been better ammunition than that? 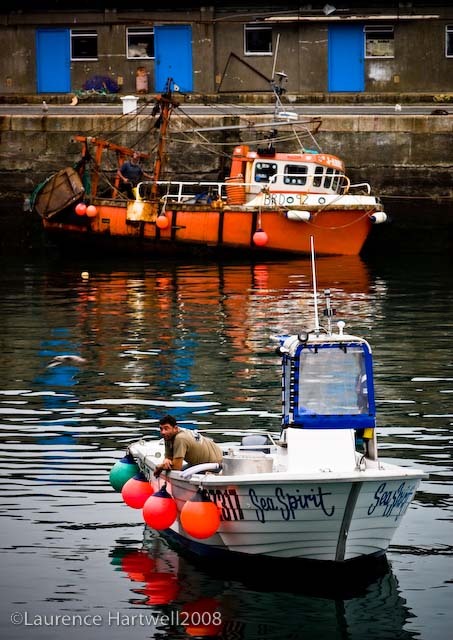 “So in the end, most Cornish fishermen flew the Canadian flag, and that spread fast. 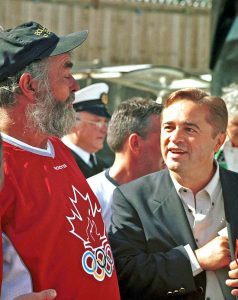 Others around the UK were buying Canadian flags, and Brian Tobin, Canadian minister of fisheries and oceans, and later the premier of Newfoundland, came to Newlyn to join us as our guest of honour at the Newlyn Fish Festival. 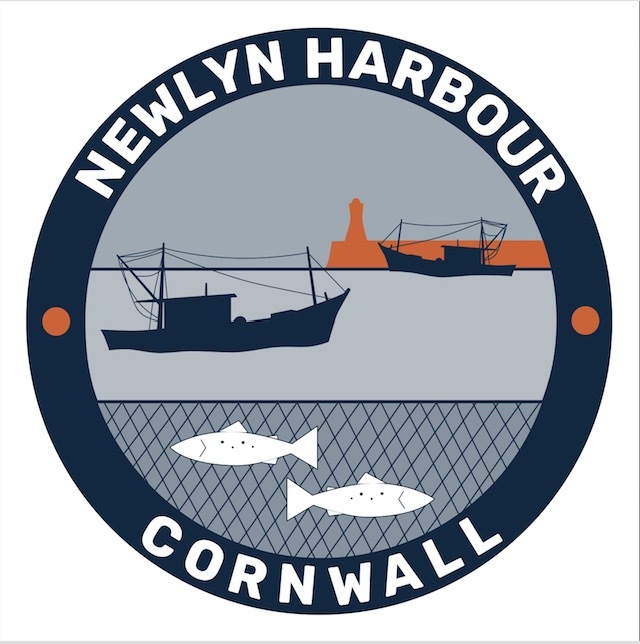 “His support was massive, and I asked him, if he ever became prime minister of Canada, would he come back to Newlyn, and he said, ‘You bet I will, Mike; you lads at Newlyn ask me, and I will be on the next plane.’ By then, being 100% behind the Canadian flag protest, fishermen in Cornwall had the full power of the press behind us, and we used it. “Contrary to what the UK government and the NFFO had thought, hardly any British people supported Spain’s fight to keep catching Greenland halibut. “Even though the Canadian fishery officers had arrested that Spanish boat just outside Canadian waters, in the minds of so many people, the Canadian government was acting legally and had won the hearts of millions – and we had also won the hearts of so many people in the British fishing industry. “Feelings toward the CFP were souring; British people could see that our fishermen were being forced by Brussels to throw back dead fish. Local MPs, like David Harris (Tory), were great supporters, and not only Tories were our supporters – so many other MPs were behind us. “The action of our government in encouraging our people to support Spain had failed; whatever ashes there were had blown back in their face. 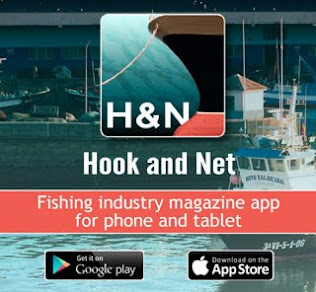 This and all the other leading stories from the industry are available from Fishing News publications either online or in print via subscription.